You know how crazy I am about this set, so when I saw Samantha Mann's card, I actually squealed ~ it is SO STINKIN' CUTE!!!! I love the color scheme, and the background paper is so neat! 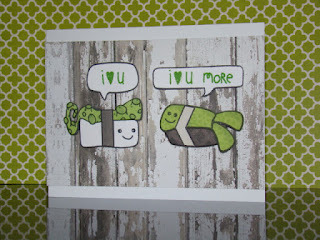 Samantha used this set, Sushi Bar, for her card. Thanks for stopping by today, and please hop over and leave our Creation Blvd. Showcase some love! Ha ha! Awesome to see my card featured!! Thank you! I loooove that set!! way to go Samantha!! this is too cute! !